The New Minuteman Kleen Sweep 25W is an economically approved walk behind sweeper. This carpet sweeper has a large cleaning path of 25" and offers excellent performance on carpeted or hard surface areas. With its easy maneuverability and excellent hopper capacity the KS25W is ready to hit the ground "cleaning". 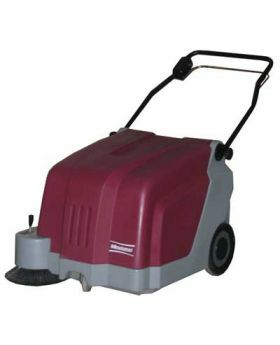 We also offer a large selection of accessories and replacement parts for the Kleen Sweep 25 carpet sweeper.